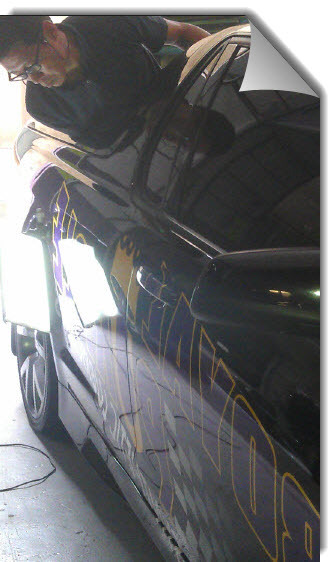 The Ding King is an independently owned business specializing in mobile Paint less Dent Repair (PDR). We are serving individuals, car rental companies, smash repairs and insurance companies to fix no paint damaged minor dents, dings and Hail damaged car repair. We are in mobile car dent repair services and your driveway is our workshop. Many dents can be removed completely and dents and dings will not back in later, as it is a permanent dent repair, while with some dents it is possible to improve those to the point where they are far less noticeable meaning you can avoid the cost of repainting from the traditional smash repair shop. If your car have minor dents or dings look no further for a low cost, highly efficient service, no need for expensive traditional smash repair shop costs also paint less dent ding repair take a fraction of the time. Whether it’s a minor dent or crease dent from a runaway shopping trolley or more extensive door dings caused by another car door. We are highly-skilled licensed PDR expert, using specially designed the latest paint less dent removal tools, gently massage dents and dings out of a vehicle’s body from behind the affected panel without harming the original paint finish and trimming off in most of case.